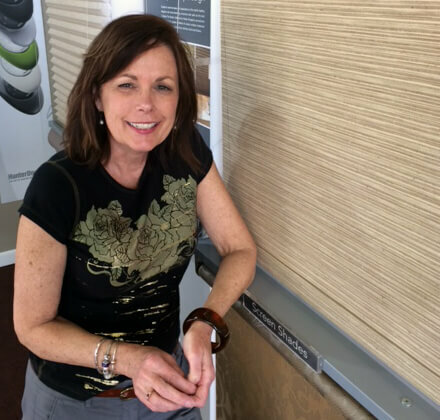 Pioneer Window Fashions, a local business for over 50 years, is owned by Nancy Brunell. Nancy is part of a fourth-generation family with experience owning small businesses since 1957. Pioneer Window Fashions, plus its sister company, Pioneer Glass, opened its doors in 2013. Prior to Pioneer, the company operated under another family for decades. Pioneer Window Fashions operates under the principles that has defined the Brunells since opening their first business in 1957: the customer’s satisfaction comes first. Pioneer Window Fashions upholds the highest standard of customer service and reliability. Pioneer Window Fashions is dedicated to providing dazzling home design with quality home comfort. The sister company in the family, Pioneer Glass, provides full-service glasswork and installation for auto, residental and commercial glass. Together with Pioneer Glass, Pioneer Window Fashions has become the premier location for all things interior design in the Blackstone Valley. Nancy, a Central Massachusetts resident her entire life, knows classic New England style and Victorian design, having helped decorate many functions, including the annual Old Sturbridge Village gala. In addition to her professional work, Nancy’s home was featured in Better Homes and Gardens‘ magazine. Serving quality Hunter Douglas window treatments, while offering Thibault wallpaper, Tableaux wrought iron elements, ceiling fans, lighting and more, Pioneer Window Fashions is your one-stop shop for all your interior decorating needs. Why should you buy local? Local companies can offer more hands-on customer service, providing you with the attention to detail necessary to create the best presentation of your design choices in your home. We offer customized quotes and information, convenient in-house visits and professional installation services instead of having to go to a big-box retailer, try to figure out what works for you, flag down a worker to get the bare minimum of information, and blanch at the outrageous installation costs that bigger chain outlets demand. We know our products. We know they’re high quality and that they last. Our offerings are selected with the needs and tastes of the local community in mind, not just what happens to be the rage across America. Our employees have been born, bred and live in the community — no better expert on what is trendy locally than a local person! Spending locally ensures sales taxes are re-invested in the community and helps build a stronger local economy. Or use the form below and we will reach out to you.